Who wouldn’t want to make a decent amount of money from their work? There are a lot of small businesses that won’t even get a chance to make a million in 20 years, but Tapulous, a top app developer for iPhone, has mastered that art by making $1M a month. At least that’s what the company is claiming. The company’s games have been installed and played millions of times, so it’s not too surprising to see the company doing well these days. For those who are wondering how Tapulous makes money from its apps, the company is not making all its revenue from game sales. In fact, it has a hybrid business model that combines free offerings, ad display, and complementary products (songs). 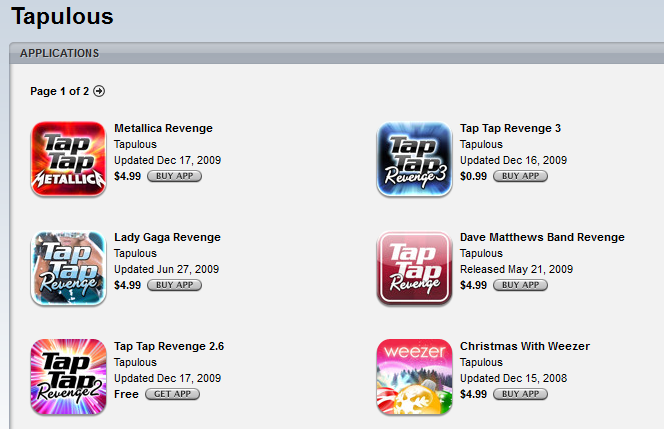 The free applications not only help push the brand, but they also make it possible for Tapulous to reach more homes. We always have marketers who try to sell you products that teach you how to make $1 a month online. But Tapulous is almost pulling it off, and it’s not due to dubious tactics. The company’s games are based on viral concepts and the business model just works. The company also knows how to promote its iPhone apps. It’s a great case study for those who want to start a business around iPhone. The same applies to Android as well. These two technologies are going to be hot for the foreseeable future. Whether you already have a decent job and just want some additional income or just want to start your very first small business, studying companies such as Tapulous helps. Running a business is neither easy nor straight forward, but if you have an idea that could go viral, there is no reason you can’t develop an app around it and monetize it.